What does your conference room say about your business? You never get a second chance to make a first impression. When you meet with clients on your turf, the design, conference room furniture type and even the name of your conference rooms can make a positive impression for you. Your conference room is the centerpiece of your office. You not only meet with clients there, but you also hold meetings with everyone in the office. It’s a space for ideas, new plans and great working relationships. With all that in mind, it needs to communicate the right message. Here are some ideas to consider. Your conference room walls are the perfect place to help visitors, and your staff, understand the values and culture of your company. Logos from clients you’ve worked with before, pictures of your products or photos illustrating your services will set the tone. In addition to what you have displayed in your reception area, you can also use vision and values posters in the conference room to inspire your team members and illustrate what is important to your organization. Rather than A, B and C, you can pick names for your conference rooms that reflect your culture. For example, SEOMoz is a San Francisco-based company that makes search engine software for companies. 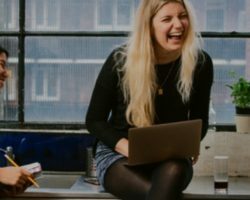 One of their company values is to be fun, and in that spirit their conference rooms are named the Batcave, Hall of Justice, Death Star and other geeky references their target audience would get. Another example is a creative agency in San Diego. They named their conference rooms after nearby beach towns – La Jolla, Del Mar and Carlsbad. Animal names, movie names, names of industry leaders and inspiring words are also common choices. So get creative! Buying a comfortable conference room chair—like our popular Joplin chair from Woodstock—is a first step, but you also have to be sure that the chairs fit nicely around your table. These chairs are a great fit for small conference rooms, or your common workspace. 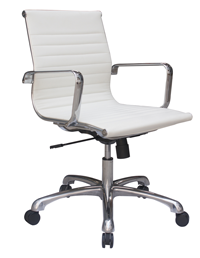 Although the average width of an office chair is 24 to 30 inches, that’s not enough space to be comfortable. In order to give everyone some elbow room, make sure that each chair has 36 to 42 inches of space along the length of your conference table. If you do a lot of planning and workshops in your conference room, make sure it’s at the upper end of that range to accommodate papers, laptops and tablets. Your conference room table shape can inspire creativity and collaboration—and also say a lot of about your company. For example, a classic rectangle communicates that you value traditional hierarchy. There’s a clear “head of the table” where the focus goes. A U-shape conference room table allows different people to take control of the meeting and present from the inside of the U. It can also make the room feel more productive and collaborative. A round table can make things equal, but can also be difficult to talk across and to designate a specific speaker. 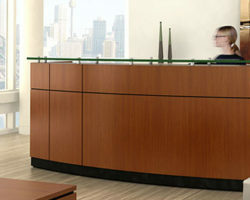 Looking for more ways to transform your office space for clients and employees? 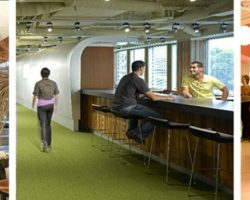 Your Office Layout: What’s it say about your business?